1 October 2013 – For the first time in forty years the UK will get the chance to witness one of the most outstanding displays of horsemanship in the world. The Royal Andalusian School of Equestrian Art is one of only four* ‘High Schools’ of its kind and its show has become so prestigious that it attracts visitors from all over the world to its home in Jerez De La Frontera, south-west Spain. This December they are coming to London to perform at Olympia, The London International Horse Show, to bring a touch of Spanish magic to one of the oldest shows on the international circuit. The school’s famous equestrian ballet show is titled ‘How the Andalusian Horses Dance’ and combines classic dressage with Doma vaquero, the traditional working riding discipline of Spain. The display is brought to life by vibrant Spanish music and authentic eighteenth-century style costumes. The stunning white and bay stallions used by the school are all pure Spanish-bred Andalusian horses. The breed has been native to the Iberian Peninsula for 3,000 years and their poise and nobility made them a tool of diplomacy by the Spanish government and used by Kings across Europe for centuries. Today, they are renowned for their agility and striking beauty, with their strong but elegant build and long, thick manes and tails. Each horse at the Andalusian school must complete at least four years of training before they are fully capable of mastering the complicated techniques and ready to perform in front of an audience. The Royal Andalusian School will be thrilling the crowd twice a day throughout the Olympia week, the 16th to 22nd December, in a shortened version of their famous show. However, on Monday 16th December Olympia is presenting ‘The High School Gala Evening’ which will give visitors the opportunity to see the school’s full exhibition. The complete repertoire shall include technical and intricate equestrian moves in advanced dressage, traditional Spanish country skills, driving and work in-hand. A show-stopping group display of horses and riders finally come together in unison to complete the magnificent performance. – Doma vaquera: The rider drives the horse around the arena using only one hand, from trotting to galloping, changing rhythm and performing pirouettes and arreones. These are movements needed in the country when handling cattle herds. – Classical dressage: Horses carry out advanced equestrian exercises, always in time with pieces of classical music which accompany them. 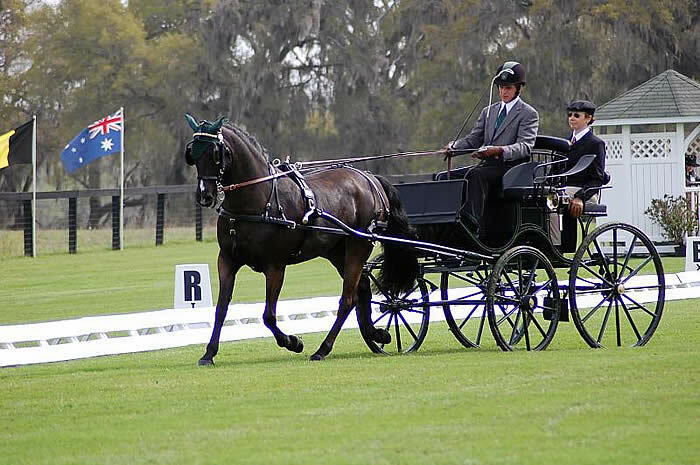 – Driving: A demonstration of the exciting skills of carriage driving. These horse-drawn carriages, originally used for transport but these days relegated to sport and exhibitions, are driven by coachmen using classical harnesses. – Work in hand: Classical high school dressage exercises such as levades, caprioles, courbettes, piaffe (between pillars), the Spanish walk and long rein, all completed by the horse with the rider on foot. – Carrousel: A group of horses and riders, in unison, perform advanced equestrian exercises in the arena to provide a most fitting end to the performance. Tickets for Olympia, the International Horse Show, start at £35 each and discounts for groups, children and concessions apply for certain performances. For more information and to purchase tickets online, visit the website at www.olympiahorseshow.com or telephone the box office on 0871 230 5580. * The other three schools are The Spanish Riding School in Vienna, The Portuguese School of Equestrian Art and The Cadre Noir in Saumur, France. Lexington, KY – The United States Equestrian Federation (USEF) is proud to announce the names of five equestrians who have been selected to receive the year’s most coveted awards. Presented by the USEF, the Lifetime Achievement Award, Junior Equestrian of the Year, and the Pegasus Medals of Honor will be presented during the Pegasus Awards gala on Saturday, January 14, at the Hilton Cincinnati Netherland Plaza. Additionally, the Equestrian of the Year Award will be announced at the Pegasus Awards. More information about that is available here: http://www.usefnetwork.com/news/7915/2011/12/14/usef_announces_the_2011_equestrian.aspx. Virginia’s James “Jim” Wofford, 67, is a legend in his sport of Eventing. A decorated athlete, Wofford has helped shape an industry as a trainer, clinician, author, and administrator. His lifelong involvement with equestrian sports and his incredible list of accomplishments have secured his place in history.